Akai’s new controller keeps the design simple and the cost low. Ten years ago or so I really wanted a generic MIDI controller with some faders and whole bunch of assignable knobs that could be mapped to Live and Reason for laptop gigs and the like. 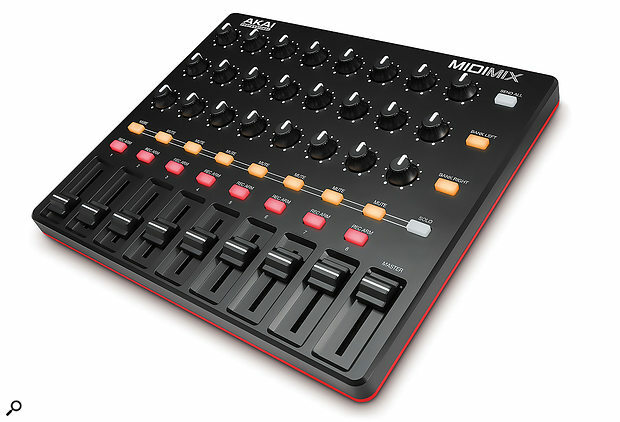 But now there are so many intelligent controllers around, with deep software integration, clip launch pads, dynamic mapping and more, is there still a place for a basic MIDI surface like Akai’s new MIDIMix? Well before I jump to conclusions, there’s the matter of price. The MIDIMix retails for less than £60$100, and is also very small and portable, making it a tempting add-on. It’s also not quite as generic as I first thought, as a Live remote script adds dynamic control features for Ableton users. The MIDIMix is really compact, just 24cm wide. It appears to share the same shell as the APC Mini, and has the same bank of nine recessed faders. Above the faders are two rows of buttons labelled with their default Live functions: Rec Arm and Mute. The Mutes can be switched to a secondary bank, which is mapped to Solo in Live. Most of the remainder of the panel is devoted to three rows of eight knobs. The knobs are small and low profile, reducing the unit’s bulk in a bag and ensuring it won’t get broken while in there. However, there’s a trade off in ergonomics: the shortness of the knobs, and their steeply angled sides makes them rather awkward to use. This is compounded by the large protruding position indicator, which in some positions helps get a better purchase on the knob, but mostly makes it difficult to turn. You end up having to grip the knob and turn your whole hand instead of twisting it between your fingers. The MIDIMix’s knobs might be small, but there are plenty of them.The knobs are not endless encoders, they have a physical range of 270 degrees. As with all pots of this type, this means that the physical controls will not always be in sync with the parameters they are mapped to. This is not so much an issue with Live with its clever scaled take-over mode. However, Akai are suggesting the Send All button on the MIDIMix as a solution to this issue, as it transmits the current values of all the physical controls. Now, while this will put all your controls in sync, it also changes all your settings in the software. I guess it could be have some use certain situations, such as playing live, where you might prep part of a performance with some known values and re-sync the controller. Akai’s web site blurb, however, has a strange rambling explanation that this feature solves an age-old issue around transferring a mix from a performance site to a later DAW mix. Eh? The MIDIMix has a Live remote script providing direct integration with Ableton Live’s mixer. Faders, Mutes, Solos and Rec Arm buttons work as you’d expect, with the rows of knobs mapping to Sends. In Live the Bank Left and Right buttons shift the mapping between banks of eight tracks (it would be nice if they lit up to indicate bank position or availability). It’s pretty much as simple as that. There’s no Device control, which is a bit of a shame. I’d have preferred the top row of knobs to control macros on the selected Live device. Of course you can remap controls, but these will be hard assignments, not dynamic. However, the MIDIMix did prove genuinely useful used alongside the Launchpad Pro or a keyboard controller, providing a fast way to focus different tracks for playback and recording and set rough levels. The MIDIMix’s delightfully self-explanatory editor software. Without other remote scripts or conformity to other control protocols, mixer control in other DAWs is limited to manually mapping of specific parameters. Check whether your DAW of choice supports this — I could do it in Reason but not Pro Tools. 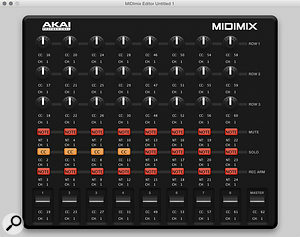 However, the MIDIMix was useful in all DAWs as a plug-in instrument controller, where MIDI mapping is usually supported. 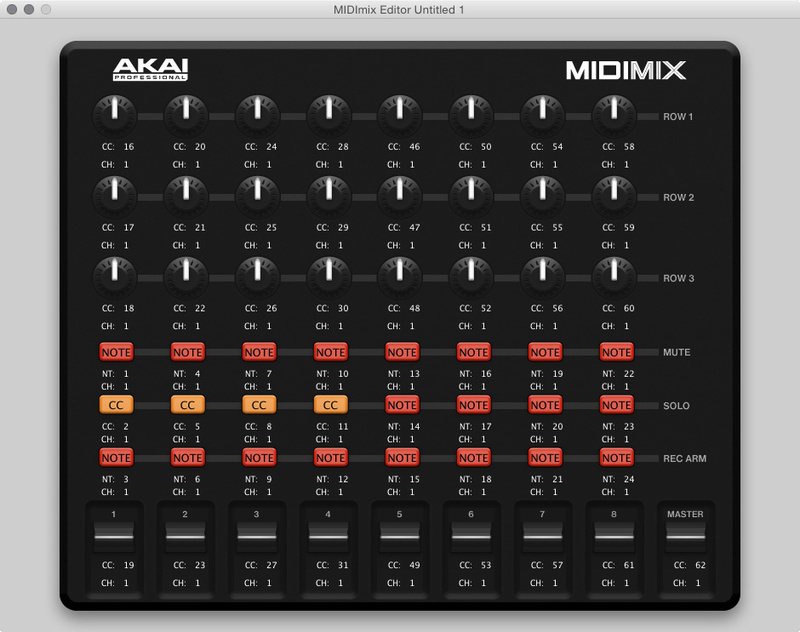 Like all Akai controllers, MIDIMix ships with a good software editor. The CC and Channel assignments of all knobs and buttons can be changed, and the buttons can be switched between Note and CC messages. There’s no banking of control assignments outside of Live. The software editor can be used to create, save and load presets. Unfortunately the original preset is not supplied, which I found out after I’d made changes and couldn’t get back. There is no ability to load and recall presets on the hardware. The MIDIMix is a very affordable and portable MIDI control bank with travel-proof recessed faders and low-profile knobs. It has a fairly limited feature set, but at this price you get a lot of controls and you might consider adding it alongside other controllers to perform a specific task. It has greater depth with Live (in fact it’s listed on Akai’s site under ‘Ableton Controllers’), although you should consider what you’d use it for as there may be other devices closer to your needs, including Akai’s own APC Mini, which shares most of the MIDIMix’s Live functionality, plus a generous 8x8 launch grid for the same price. As a Live controller, or companion to a launch grid or keyboard, the closest alternative is Novation’s Launch Control XL. The XL has a similar set of controls, albeit of better quality, but is more than twice the price. However, it’s functionally superior, with Device Control and a separate User layer. 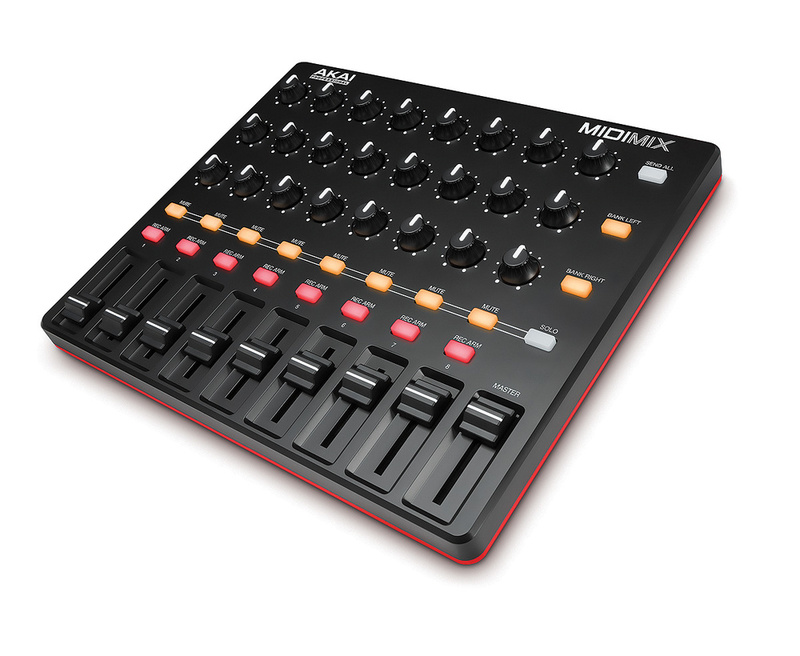 The smaller model has fewer knobs and no faders, but has a similar feature set to the XL but at MIDIMix’s price. Sticking with Live, check out Akai’s APC Mini, which may suit you better. Otherwise, as a generic MIDI controller there’s little else in this form factor and price range. If you’re really looking for a low-cost studio controller with rotary encoders you’ll need to double the budget and look at Behringer’s BCR2000. Lots of controls for the money. Can only change programs from software editor. Knobs are awkward to use. An old-school MIDI control bank at a low price, which could be useful in a live rig or portable Ableton setup.